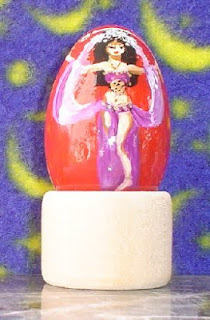 The Occidental Dancer: Happy Easter! Please do celebrate the blessed miracle of baby Jesus being pushed into an egg and transformed into a chocolate bunny with this splendid image. I searched for a "bellydance egg" without much hope of finding one, but she who has no faith in the internet may as well trade her laptop for an Etch-a-Sketch. Amen. Having featured a zombie belly dancer and threatened you with the fires of Hell last Easter - yes, you, with your wanton hips and your love of moving to music! How very dare you - I thought this year I'd give you something nice. On that note, those of you who have had the post on Sherihan pop up in your feed, only to click the link and find it gone, despair not. I took the post down and have rescheduled it for Easter Monday because I found out some more mondo-bizarro, amazeballs stuff about her that NEEDED to be included.